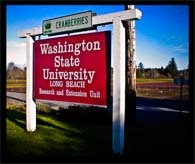 Help fund cranberry research and extension work on the West Coast of the United States and Canada. Maintain a demonstration cranberry farm. Produce cranberries on Foundation property to fund research and extension activities. Provide an educational facility for tourists, local citizens, and schools. Cranberry harvest starts early, no later than 9:00 am in the morning. Sondra Nash Eaton will feature snacks, entrees and desserts made with cranberries. Her menu is filled with cranberry items. While you eat, relax and enjoy music by country and blues artist, Steve Bowker. The gift shop is filled with jams, jellies, candies, and candles, all cranberry. Lots of shirts along with fresh Washington cranberries are for sale. Cranberry ice cream, WSU Cougar Gold cheese, five different Cranberry wines and more are available. New books all about Cranberries. Sydney Stevens is signing her book, Washington’s Cranberry Coast from 11 am-1 pm. The cute children’s book, A Dog on a Bog, author Tami Whitmore is signing from 1:30 to 3 pm. Ride the Cranberry trolley which runs on the hour from the Columbia Pacific Heritage Museum to the Cranberry Museum. Delicious Cranberry Ice Cream is now available at our Gift Shop! Privacy, ©, Credits. Please report technical challenges.